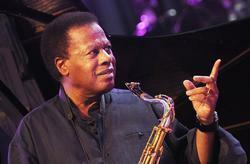 Wayne Shorter performs with his quartet at the 2008 Vitoria-Gasteiz Jazz Festival in Basque Country, Spain. The saxophonist and composer Wayne Shorter is one of the few jazz musicians who can without a doubt be called a living legend. Many of his compositions are jazz standards; many of his records are studied endlessly. He's one of the artists who both musicians and fans obsess over - and even at age 77, he continues to reinvent his musical personality with every performance. And there were Wayne's Blue Note recordings. In the '50s and '60s Blue Note was the Bell Labs of jazz, blessed with a lucky conjunction of plentiful funding, smart management and strong talent. Bell Labs produced dozens of breakthrough inventions; Blue Note produced dozens of classic recordings. A few spring to mind: Horace Silver's Song For My Father, Lee Morgan's The Sidewinder, Herbie Hancock's Maiden Voyage, Dexter Gordon's Our Man In Paris, Freddie Hubbard's Ready For Freddie. Even in such a remarkable catalog, Wayne's Blue Note recordings stand out for their harmonic complexity and memorable melodies. Wayne recorded six albums for Blue Note in one 18-month period, and these albums - The All Seeing Eye, Speak No Evil, etc. - included tunes that have become jazz standards. Happily, for everyone concerned, over the past decade or so Wayne has been commissioned to rework some of those '80s compositions for orchestra or chamber ensemble. When these pieces are rearranged for broader instrumentation and performed in an acoustic setting, their strengths are easier to hear. Many of these pieces have several intertwined melodies, for example - and if you pull out any one melody, it's striking enough to serve as the primary one. Basically, the way I see it, in the '80s and '90s, Wayne was becoming a serious classical composer, but the style and sound of his records obscured it for most fans. MM: In the jazz world, the people most "in the know" are the musicians themselves. Early on, Wayne's unconventional character and original musicianship gave him a special cachet among musicians. Whether or not they've played with him, most musicians have a good Wayne story - or five. With the growth of jazz degree programs, more young musicians began formal study of Wayne's solos and compositions. Appreciation spread and spilled over to the cognoscenti. PJ: Tell me about how this current band formed. As jazz fans surely know, Brian Blade, John Patitucci and Danilo Perez - drums, bass and piano, respectively - are some of the most incredibly talented musicians in jazz right now. How did they all meet for this group? This article has been viewed 5,368 times since being added on February 7, 2011.